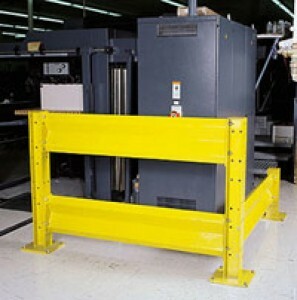 Crash Guard Safety Rails | Dock Door Systems Inc. Improve plant safety and efficiency with Crash Guard Safety Rails by reducing the costs associated with employee injury, machinery down time, insurance claims, and building repairs due to accidental collisions. Safety Rail sections shall be constructed of formed 10 gauge ATSM A36 steel welded to 1/4" steel end plates. Rail beam cross-section shall be 12" high and 2 5/8" in depth. Rails will be provided to lengths of no greater than 12' with rail lengths based upon center-of-post to center-of-post measurements in 1' increments. Rails will be delivered with 1/2" mounting hardware.